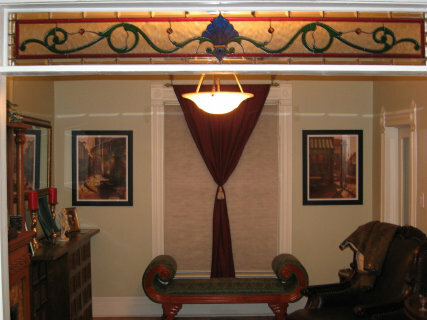 Greg wanted an interior transom over french doors in his charming 1887 home in Denver, Colorado. He sent me a picture of a classic simple Victorian transom that he liked. We reworked his design to create a new unique design. This piece was a challange to design because it is only 8 1/2 inches tall. Built entirely of clear, green, red, blue & amber waterglass, amber jewels, and surrounded with bevels, this transom literally sparkles in the light. Greg's Transom measures 8 1/2 " by 61 7/8 ", contains 131 pieces of glass and was completed in November, 2006.